Last weekend, in the final hours of its session for the year, the New Mexico Legislature unanimously passed a sweeping bill, HB 560, that effectively bans the practice of civil asset forfeiture, an egregious tool used by law enforcement in many instances to seize assets from innocent people without ever charging them with -- let alone convicting them of -- a crime. Gov. 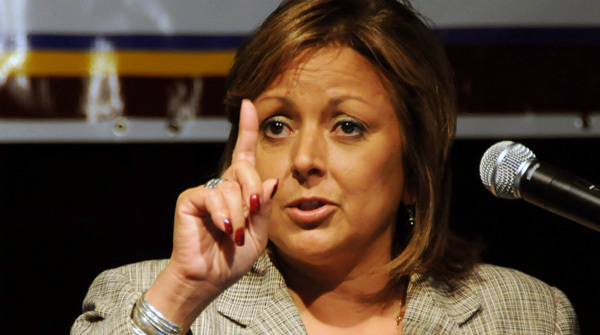 Susana Martinez, a Republican, has been quiet about HB 560 since its passage. A spokesman for Martinez, a former district attorney and the State Bar of New Mexico's 2010 "Prosecutor of the Year," told Watchdog.org that she 'will review each bill in its final form and give them all due consideration." HB 560, which, again, had overwhelming support from Republicans and Democrats in the state legislature, would be among the strongest civil asset forfeiture reforms in the country. It would bring important protections for individuals who may have encounters with overzealous law enforcement by requiring a criminal conviction, a very high standard in which the burden of proof is on the government, before the state can seize their property. The legislation would also remove the profit motive behind seizures. This, perhaps, can be best exemplified by Harry S. Connelly, Jr, the city attorney for Las Cruces, New Mexico, who, at a seminar on civil asset forfeiture in September, talked about the "little goodies" police hoped to seize from individuals through predatory practices. "We always try to get, every once in a while, like, maybe a good car. There was a stakeout at a bar, and this guy drives up in a 2008 Mercedes, brand new. Just so beautiful, I mean, the cops were undercover and they were just like ‘Ahhhh,'" Connelly said in a video obtained by The New York Times. "And he gets out and he’s just reeking of alcohol. And it’s like, ‘Oh, my goodness, we can hardly wait.'" Connelly lamented that the car had to be turned back over to its owner because police didn't follow proper procedure. Connelly, who was later criticized for his comments, bragged about the virtually unchecked power that civil asset forfeiture brings. "We could be czars," he said. "We could own the city. We could be in the real estate business." Under current law, law enforcement can keep up to 100 percent of the proceeds of forfeited property to fund their operations. HB 560, however, would direct these proceeds to the state's general fund. Though Martinez has been relatively silent about HB 560, one of her Republican predecessors, former. Gov. Gary Johnson, who served from 1995 to 2003, is urging that she sign the bill into law. "When I first became governor, I bought into the argument that this was a tool law enforcement needed," said Johnson in an interview with Watchdog.org. "I bought into that argument, and I reversed myself in a really big way, recognizing that it’s really very, very abusive. And if you happen to be the individual whose assets get confiscated, it can be devastating." "Please sign this legislation. It’s positive, it’s constitutional and, look, it’s not a deterrent," Johnson said when asked what he would tell Martinez. "This is tyranny. This is tyranny. Put an end to it." The Washington Times' conservative editorial board strongly endorsed HB 560, writing that civil asset forfeiture "is nothing less than government crime, enabling police to seize private property and keep it without even having to charge someone with a crime." Martinez has until noon on Friday, April 10 to sign HB 560 into law or veto it. If she chooses to take no action, the bill is pocket-vetoed.